After winning the Order of Merit and beating Tiger Woods recently, the European No 1 came back to earth with a bump at the Gary Player Country Club in Sun City. The Dubliner had stormed to five under par and into a three shot lead in the 12-man event with just five holes to play. But he got overconfident and dropped back to back shots to end the day two adrift of first round leader Henrik Stenson. Harrington said: "I started to get a little ahead of myself at 14 and was beginning to think I was invincible. "But I played well, I was hitting the ball well and the course is only going to get tougher. "The greens were quite soft today and the pins were generous, but this course has got to be the most severe course for swirling wind." Harrington got off to a sensational start, going to the turn in four under par 32 in a round that included four birdies in a row from the seventh. But after going three clear of England's David Howell, he soon found himself trailing in hot, windy conditions. At the par five 14th, world No 8 fired his approach into an island of thick love grass in a fairway bunker. Finding the ball unplayable, he was forced to take a penalty drop back in the fairway but failed to get up and down for par. He then needed a free drop from the grandstand at the back of the 15th after flying the green with a short iron. But he fluffed his pitch and did well just to drop one shot after chipping eight feet past the hole with his fourth. He wasn't the only player to struggle on the back nine with Els - joint leader at one stage - dropping four shots in three holes from the 15th on his way to level par 72. Stenson birdied all four par fives and then picked up another shot at the 15th to get round in 67 and lead by one from defending champion Jim Furyk on his Nedbank debut. Harrington finished the day in a share of third place with Howell on three under with South Africans Charl Schwartzel and Retief Goosen a shot further back after 70s. World No 2 Furyk was a model of consistency, firing four birdies in an immaculate 68. But it was a bad day at the office for American Chris DiMarco and Scot Colin Montgomerie after respective rounds of 74 and 75 left them propping up the field. The winner of the event will take home a cheque for $1.2 million. 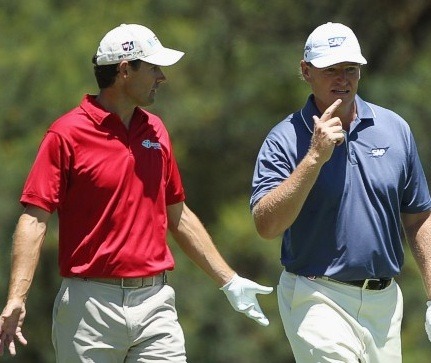 Padraig Harrrington went from hero to zero as Jim Furyk retained the Nedbank Challenge in Sun City.